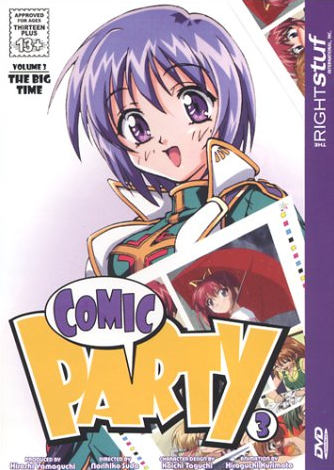 Comic Party was a 13 episode 2001 TV series based on a reasonably popular Leaf game. The series was released in the US by TRSI's own anime label back in 2004, first in single volumes with a complete box set following in 2006. It's possible to pick it up cheaply at the moment and I'd recommend doing so sooner rather than later, as it's out of print and with the sequel still readily available, demand is likely to force prices up with every passing day. I own the single DVD volumes so I can verify that they're good value. Each comes with a reversible cover with the Japanese title and a thin colour booklet packed full of liner notes and artwork. The artwork often parodies other famous anime series with amusing results so I'm glad that The Right Stuf included as much of this work as they could. 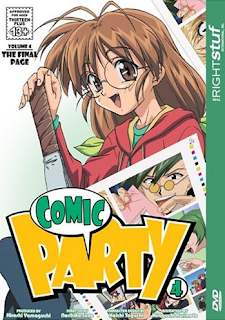 There are on-disc extras too with more translation notes and a bonus ongoing miniseries which sends the characters on a silly quest in swimsuits. The video quality for the actual anime episodes themselves is quite poor; while it was probably the best that TRSI had to work with at the time of its release, it's full of dot crawl and evidently comes from a composite master. Thankfully the simple designs stop the fuzzy picture being too distracting once the action begins. My original reason for picking the series up was that it has an unusual gimmick: to set itself aside from other dating sims, Comic Party is set in the world of doujinshi creation. Being a somewhat avid collector of doujinshi myself, I'm always interested to see how the hobby comes across in fiction. 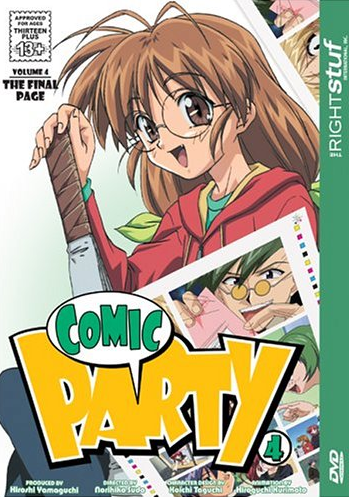 Since Comic Party is actually written from the perspective of the creators themselves it's completely different to shows such as Genshiken and Otaku No Video where we see everything through the eyes of fans. I was hoping for something more like Doujin Work, or even Bakuman, both of which are fantastically enjoyable series. There's certainly plenty of interesting insider information to be found in Comic Party. It's as though it's two different series in one; an insipid teen romance and a silly doujinshi production documentary aimed at otaku. The latter elements cover a variety of different topics, from the economics of doujinshi creation to making new friends at events. Everyday events like a printer running out of laser toner are treated as terrible disasters. 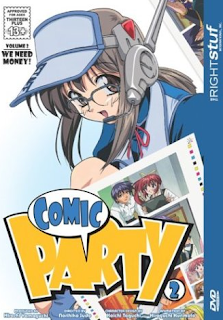 Unfortunately, in order to highlight all of the things which can go wrong in the production of fan comics, main character Kazuki is presented as an unbelievable moron, falling into every possible trap as he learns more about the hobby and never learning to think things through properly by himself. His complete lack of capacity to learn or think for himself put a dampener on my ability to enjoy the show. Although I often enjoy anime based on adult dating games in spite of being outside the target audience, Comic Party's romance aspect was so weak that I found it difficult to take seriously. The television series introduces a lot of eligible young ladies yet the lead female is the only one who is shown to have any real chance with Kazuki, and this is the problem. Mizuki comes across as a highly presumptuous control freak with stalker tendencies. She has absolutely nothing in common with the lead other than her general uselessness. She's pretty, however at no point did I feel interested in seeing her succeed in her desperate attempts to woo the hero and her contributions to his life often got in the way of his personal growth rather than being helpful. At one point I realised that I was enjoying the moments where she becomes disheartened and sad more than the scenes of the two happily working together; never a good sign! Almost any one of the other girls in the series would have been a more enjoyable romantic interest. Down-to-earth doujinshi fanatic Yuu would have been my personal preference; she's straightforward, hardworking, true to herself and good natured. I can't work out why the creators instead chose to go with the irritating Mizuki and doom the romantic subplot from the outset. I feel quite sorry for the English language subtitle scriptwriters as avoiding dropping obscure Japanese terms into the dialogue must have been a challenge. Although doujinshi are explained over the course of the series, the characters frequently refer to other concepts with no precise English equivalent such as sokubaikai events (rendered as 'exhibition and spot sales' in the subtitles). Viewers who don't have an interest in doujin culture may struggle though the presence of the translation notes mitigates some of the awkwardness. 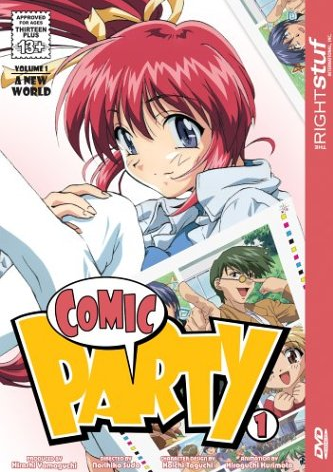 It's not blessed with stunning artwork or expensive animation, the characters are simple and the music varies between bland and actively annoying, but there are worse ways to spend a few hours than watching Comic Party. This is especially the case for those interested in the world of doujinshi as it goes far beyond the seedy adult works most western fans associate with the term. The climax of the series comes about during a winter event at Tokyo Big Sight, so with the real-life Winter Comiket playing out this weekend it felt like the perfect time to settle down and finish watching.